Your quest for the perfect dungeon is over! (or at least we're giving you one heck of a try at it!). Say goodbye to crudely drawn maps (not that we have anything against crudely drawn maps! ), goodbye to expensive plaster, goodbye to time consuming hobby terrain, goodbye to wrinkled posters and one dimensional tiles! 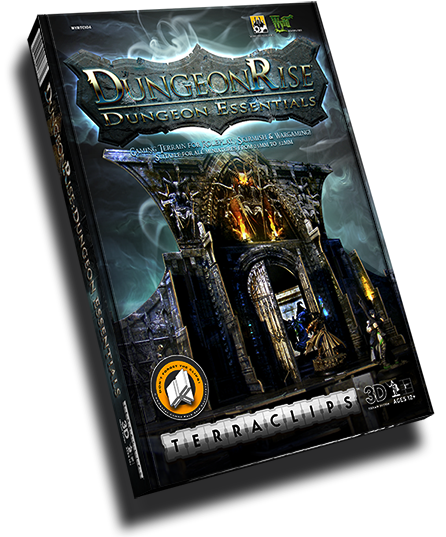 DungeonRise: Dungeon Essentials is the first of 3 upcoming sets in the next wave of TerraClips releases. 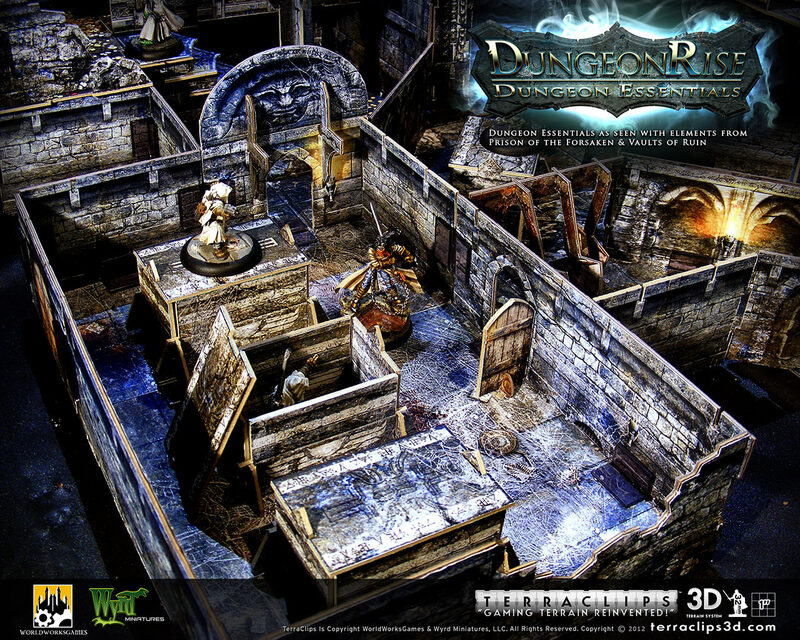 Giving gamers what we feel is the ultimate toolkit to create incredible 2D and fully 3D, modular, multi-level dungeon environments! Simply punch out the robust 1.7mm punchboard components, clip them together, add or remove walls on-the-fly, build up, build down and have a ton of fun in the process!!! 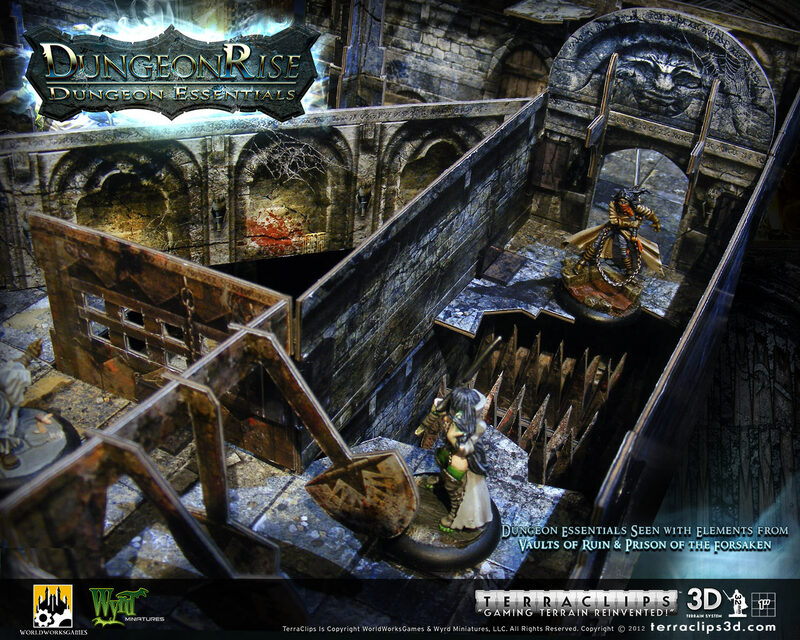 Stay tuned for next weeks preview when we unleash DungeonRise: Prison of the Forsaken! 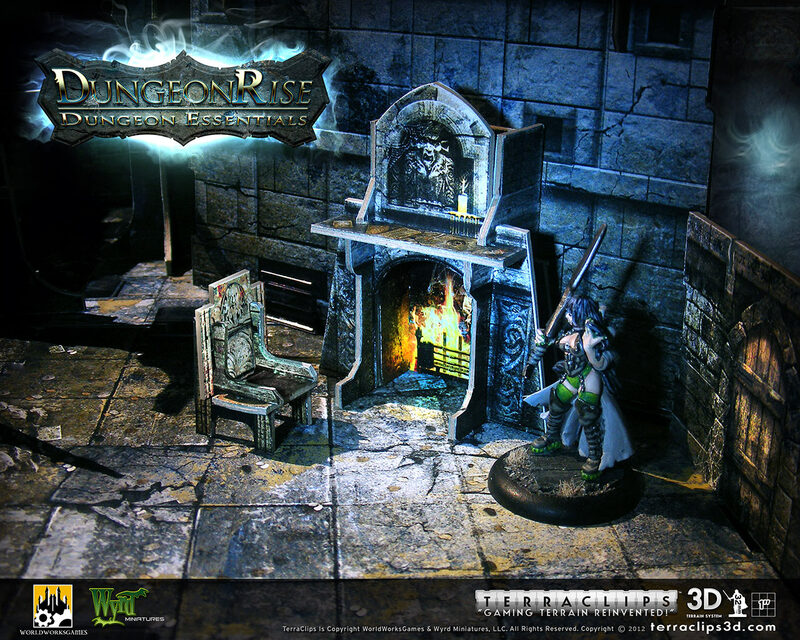 Pricing and availability for DungeonRise: Dungeon Essentials to be announced. It looks amazing. I'm excited by the 3x6's!!! Little sad about there only being 8 6x6's, but this set looks to be the set that adds more depth and a ton of cool stuff that will compliment the other two sets, which down right is awesome. Looks like my kids will have to pay for their own college....I'm going to need a lot of these. These will be my first Terraclips sets - and the new images inspire a question - has anyone tried clipping WOTC dungeon tiles into the TCP layouts? It would be awesome (and sell a much larger number of the TCP sets, I think) if there were some way to do this/adapt/etc. If there was a whole TCP set devoted to nothing but furniture I'd buy multiple copies of it. I simply refuse to believe that something so awesomely beautiful is an actual physical product*, nope, no way, not possible. 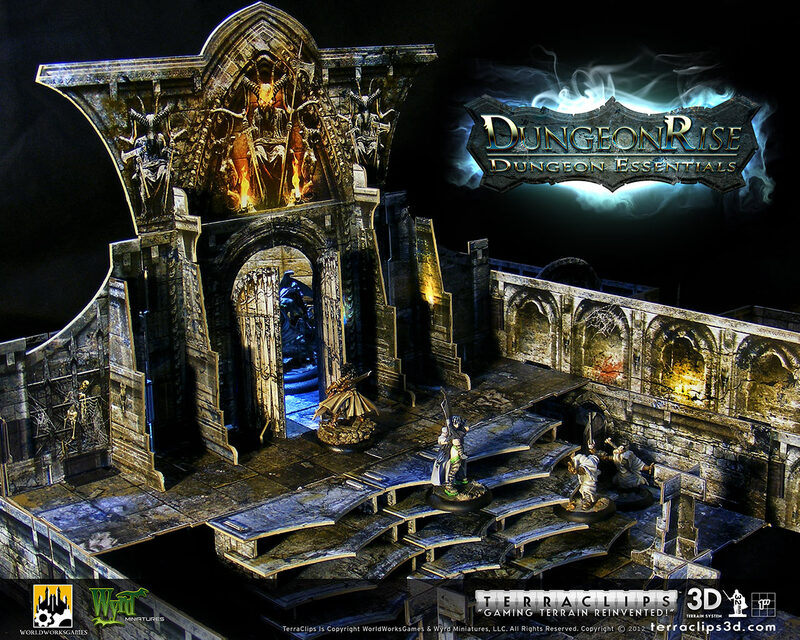 Didn't really mean to imply that this wasn't a set that couldn't be used standalone, as the main picture shows that it can be used for a single dungeon easily, more so that it looks to be heavily a set that will compliment the other two sets more so. I'm delighted to see that the tombs aren't included on the listings of the DE set, if so, I hope that means the other two sets will be including their own props, and we'll be seeing that as a future trend. You'll be happy to hear that each of the 3 releases comes with a respectful prop load. Would love to do a dedicated props pack in future though. Amazing. Simply amazing. And I was happy with the Malifaux sets. Really pleased with what I see here. The treasure room floor caught my eye right away, and as others have said...the props. With my maps, that's the one thing I feel is lacking, 3D objects and props. Looks like problem solved. is the picture of the tomb room actually from the essential set? i don't see the description of those pieces (and the damaged wall too) in the summary i see in the back of the box! it's a mistake or the table of contents wasn't updated? The images are marked with the disclaimer that they have elements from the other sets... It would be nice though if there were an explicit note with the images posted as to which pieces are NOT part of the set. I would assume that the text on the back of the essential box is an accurate description of what comes in the box. Man this looks awesome. I can't wait to get this. I hope the price is around the same as the first three. I might get two copies of the essential set. I just noticed the pillar being used to hold up the second floor of the treasure room. And the pillars in the room with the wizard's alter, could those hold up a floor above them? That's going to sweet for builds. 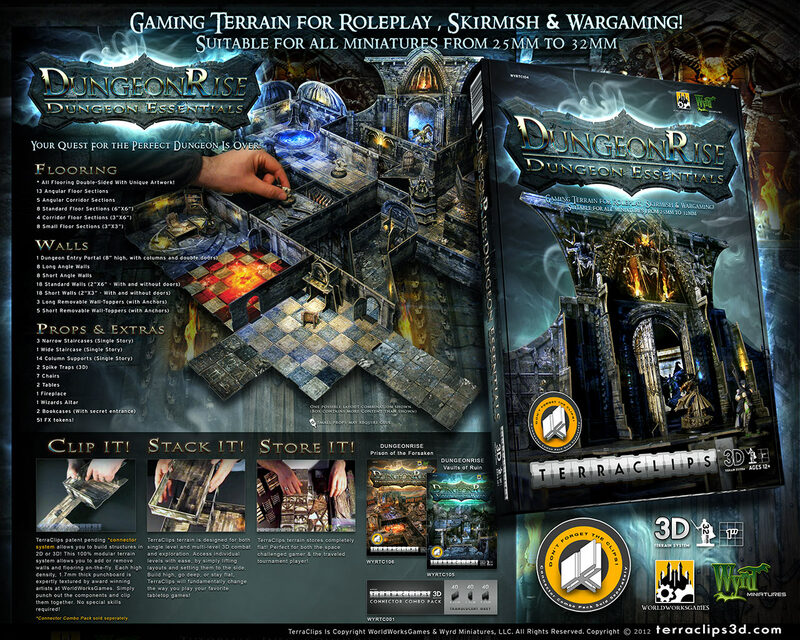 Image #7 shows the back of the box with a complete listing of contents for Dungeon Essentials http://www.worldworksgames.com/store/me ... dr_de7.jpg . I'll probably update this thread a bit when I have a minute and list it in text as well. Might add a few makeup shots as well depending on the schedule. So anyway as noted on the pictures, there are elements from various sets in a couple shots. 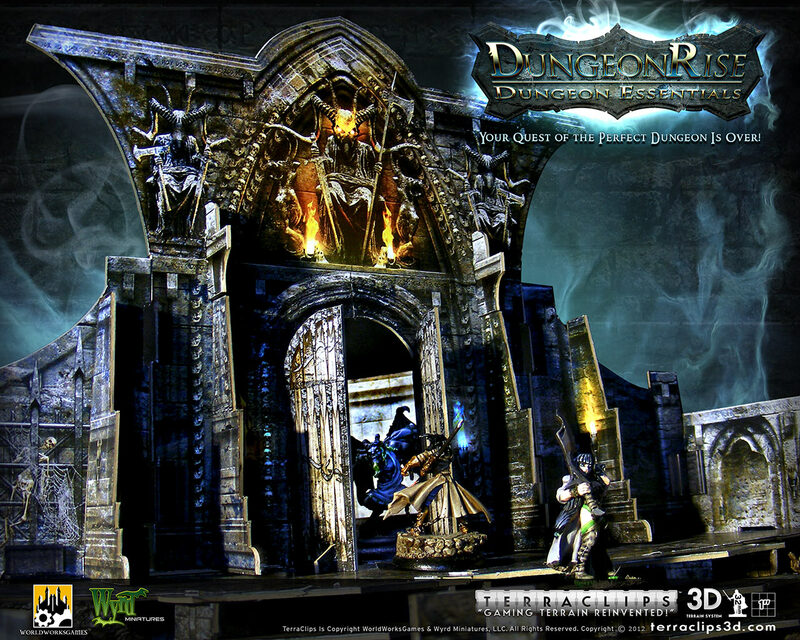 In the case of image #4 http://www.worldworksgames.com/store/me ... dr_de4.jpg you're seeing the Vaults of Ruin sarcophagus props as well as a broken wall section from that set. The 3 main sets have some pretty deep interconnection in terms of usage but they all stand on their own in unique ways. That will become much more clear as we move through the coming weeks of promotion. Yeah, those are the 2" pillars (there's also a 4" pillar but that's included in Vaults of Ruin). As with our other TerraClips sets, you don't need them to create multilevel arrangements but in this case those little pillars are great for offering additional free-floating support to unique layouts. They're actually pretty versatile. has anyone tried clipping WOTC dungeon tiles into the TCP layouts? Yup. It works, but isn't ideal. WotC tiles are bit thicker (the clips can potentially scratch them), and doesn't have the indentations (thus creating gaps when joining tiles via terraclips). Still, it allows me some kludges that I wouldn't've had otherwise. There's really only one thing I can say about these sets. And this despite having bought a brand new pack of Cardstock and 2 new TLX sets last week. Although I do not play much fantasy, these are really beautiful! I will definitely recommend them to my fantasy-playing friends. Excellent work Denny, very beautiful pieces! This looks gorgeous, and I love the greater emphasis on props. Now THIS is the set I've been waiting for! Please don't take it wrong when I say, "IT'S ABOUT TIME!" I hope there is a continuous release of add-ons beyond the first 3, both generic and strongly themed. My garage is full of a build using so many copies of the 1st 3 sets that I didn't think I would have any room left for additional sets. After viewing this I'm just going to have to make some room somehow. I can't wait for the tombs! For the floor tiles, like the treasure floors, magic rune, and checkered floors, are the reverse sides similarly done or are they more of a plain dungeon floor. All floor tiles are double sided. 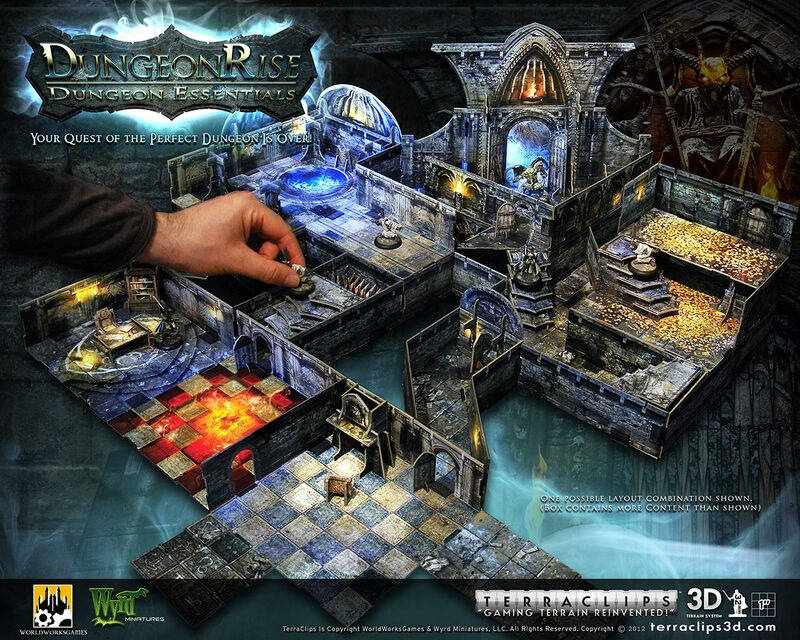 Reverse sides typically have a plain dungeon floor or one that has an alternate pattern on it. Its been balanced in a way that you have "showcase" room tiles on one side and normal tiles on the other. If I have time I'll do a front and back preview of the available tiles for you guys. I would like to see a punch that would notch the WotC pieces so that the TerraClips would help fit them together without the "space". I cant wait until this set comes out - I will be buying a couple of sets for sure. So I see the other two sets over on BoW as a Wyrd GenCon preview, are we going to get some more glimpses over here?